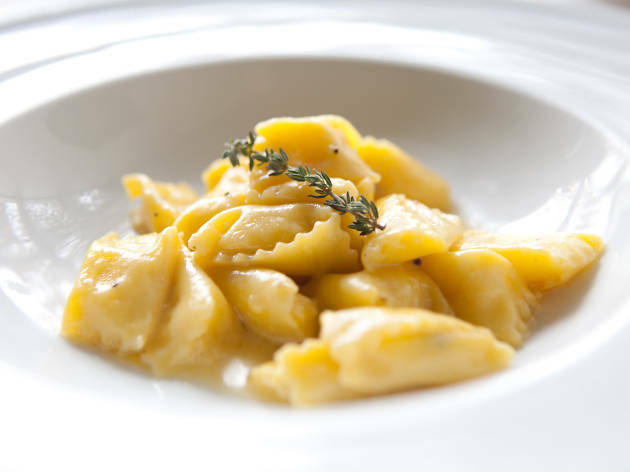 Regional Piedmontese cuisine is Osteria Langhe's focus, and that means ingredients like truffles, cream and eggy pastas appear on the menu. The space is warm and cozy, and you'll want to order a bottle of well-chosen wine for the table before diving into the food. The plin, miniature agnolotti filled with cheese, are beautiful and light; the beef tartare is impeccably seasoned; and the vitello tonnato tops tender slices of beef with a vibrant tuna citrus caper aioli. In case you needed further proof that Osteria Langhe has elevated Chicago's Italian restaurant scene, order the creamy panna cotta to finish the evening. El stop: Blue to California-O'Hare. Bus: 52, 73. Okay- this place is too good to write about. You have to go. Bring your mom, bring a date, bring ANYONE. It's too good. If there's only ONE thing you need to know about this place, its the Plin. They are like pockets of heaven that explode with joy in your mouth. Please get them and thank me later. Amazing food and a genuine care for what they have to offer the City and patrons. This lil LS neighborhood restaurant is within walking distance to us + they always seem to remember us + make us feel very welcome. The food is 'amazing' - the wine + cockatails are just as good! They have fun special offerings and sometimes have 1/2 off cocktails at the bar where you can get some frozen 'Plin' to go! 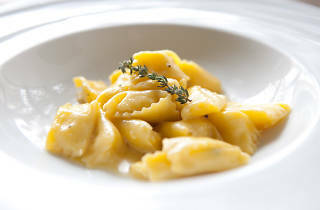 I had a wonderful experience at Osteria Langhe. This was my second time here and it continues to meet expectations. The Lumache Slow Food was a great Italian twist to a traditional French dish escargot. I have not had snail confit before and it was beyond exquisite. The Vitello Tonnato (poached piemontese beef, crispy duck egg, tuna citrus caper aioli) was an explosion in your mouth -- many different flavors that worked together. The Coniglio was divine -- crispy, tender and flavorful. Every bite was heaven -- this is how meat should taste. Finally for as simple as Tajarin is (house made noodles and meat ragu), you can't pass us house made noodles -- it is a new flavor to a classic dish. If you are looking for a lighter item, the Tajarin is the way to go. I'm probably about to make some waves with this one, but I honestly wasn't blown away by Osteria Langhe as much as I was anticipating. It could have been this particular experience, but as soon as the entree hit the table, it started to go downhill. The Plin, as expected, was one of the greatest pasta dishes that I have ever had in my life. Perfect portion size for an antipasti, creamy, cheesy goodness wrapped in a perfectly cooked, hand pinched mini ravioli, surrounded by a rich butter sauce and thyme. Then, the daily risotto made its landing, and things dropped back down to mediocrity. It had diced asparagus, chopped tomatoes, and chopped (kind of) bacon, with four lamb ribs on top. The risotto itself was slightly bland in terms of seasoning, and the bacon was horribly inconsistent. Half of it was chopped as it should be, and then there were two, nearly whole strips of soggy bacon mixed in. The lamb was overcooked, and was evident in its charred and tough texture. Finally, the bill came, and I discovered that bread apparently costs three dollars despite it being offered to you after you finish your ordering. I think its safe to assume bread is free when offered. If he had said "Would you like a filet while you wait? ", I would think it would cost something. But, plain bread and butter? If you're going to charge for something that most places give out for free, do not offer it. Just have it on the menu, and have people order it themselves. The wine offering, however, was perfect. An excellent white that paired perfectly with the Plin. Osteria langhe delivered summer night meal perfection! The space is beautiful with cozy seating, dim lighting and it really feels like you are in a little Italian cafe. The Tuesday prix fixe for $38 is a great deal if you are planning to order a few things. The plin was fantastic - little pillows of cheesy goodness. Also impressed with their vegetarian crêpe (a lot of buttery creams in northern Italian cuisine but no complaints here!) and panna cotta. Service lagged a bit but we were entertained with some delicious white wine, rosé, and espresso! Maybe I'm partial because I live around the corner from Osteria Langhe but holy smokes guys, truly a treat for someone looking to try something new or a lover of the Piedmont region of Italy. They have several weekly specials from all you can eat ragu on Sunday nights (I know but you will find yourself asking for another helping). My favorite time to go is during the week from 5-7pm or all night Mondays for their half off cocktails; a Cassoni or Cappeletti spritz for under $5 means I am having more than just one! Extremely knowledgeable staff has no problem educating you on northwestern Italian cuisine and how certain dishes pertain to this region of Italy. Piedmont is known for risotto and fresh noodles so make sure to check the boards for the risotto special and their house made noodles in your ragu! Currently selling their pasta at Food Smart across the street is also a nice way to get a taste of Italy at home. This restaurant is perfect for a nice Friday or Saturday night out. The bill can add up quickly, but you won't be disappointed. Fantastic service, good beer and wine selection, great Italian food. You'll definitely want to make a reservation.